Giving back to our community is a legacy of the Junior League of Oklahoma City that dates back to our founding in 1927. The GALA 85 event held at Oklahoma City Golf & Country Club helped JLOC raise $85,0000, enabling us to fund gifts to both YWCA Oklahoma City‘s Economic Empowerment Program and Hand-in-Hand Learning Center, and the Myriad Botanical Gardens‘ “Bringing Books to Life” project. 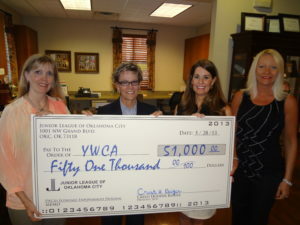 JLOC awarded the YWCA Oklahoma City $51,000 to purchase furniture, new computers, software, books and bookshelves for their Business Technology Center. Funds were also allocated to purchase furnishings, books and technology updates for the Hand-in-Hand Learning Center, which provides child care free of charge for residents of the shelter and transitional housing. As the only certified shelter for battered women in Oklahoma County, the YWCA focuses its programs on fighting domestic violence. They work to empower women through educational programs that assist women in becoming financially independent, providing women with job skills training, job placement and financial literacy education. JLOC awarded a two-year grant totaling $34,000 to The Myriad Botanical Gardens‘ Foundation for the “Bringing Books to Life” program. For children ages Pre-K through middle school, books will come alive through various art projects, hands-on demonstrations and interactive programming including plays, puppet shows, as well as science and cooking demonstrations. In addition, funds were used to create “book nooks” in the children’s garden for children to discover and have a quiet place to read.